Meghan Markle's Givenchy gown, 16-foot veil and sparkly tiara, along with one of Prince Harry's military uniforms, will go on display in Windsor Castle this fall. The wedding outfits of the Duke and Duchess of Sussex will go on display this fall at Windsor Castle, giving the public a chance to get an up-close look at the most famous bridal gown in several years. The former Meghan Markle's bateau neckline dress will be part of a special royal wedding exhibition also featuring a military frock coat identical to the one Prince Harry wore at the couple's May 19 nuptials. The exhibition, curated by the Royal Collection Trust, will also share details about the newest royal's fitted three-quarter sleeve gown. Clare Waight Keller, the artistic director for French fashion house Givenchy, designed the dress. The exhibition also will feature the 16-foot long silk tulle veil, which is embroidered with the flora of all 53 countries in the Commonwealth. The duchess added two of her favorite flowers to the embroidered decoration: wintersweet, which grows in the grounds of Kensington Palace, and the California poppy, the state flower of her native California. The veil was held in place by a diamond and platinum bandeau tiara loaned to the duchess by her husband’s grandmother, Queen Elizabeth. The tiara, which will go on display for the first time as part of the exhibit, is formed as a flexible band of eleven sections, centered by a detachable brooch of ten diamonds. The bandeau was made in 1932 for the queen’s grandmother, Queen Mary, and specifically designed to accommodate the brooch. The exhibition will go on display in October at Windsor Castle but the public may purchase tickets now. The exhibit will be open through Jan. 6 before moving to the Palace of Holyroodhouse in Edinburgh. It will reopen there in June 2019. 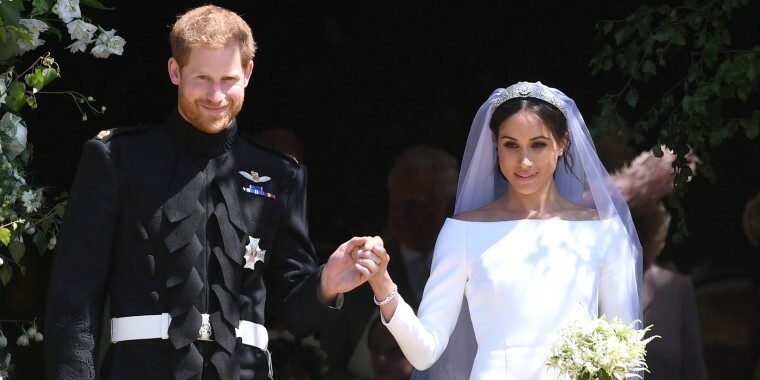 Harry married Meghan Markle in a widely-televised May 19 ceremony at St. George's Chapel, on the grounds of Windsor Castle. The couple were bestowed the title of Duke and Duchess of Sussex earlier in the day by the queen.